Canadian troops had been issued with the Canadian made Ross Rifle, but were soon abandoning it, preferring rifles they could salvage from the battlefield. The Ross rifle was long and heavy making it impractical for narrow trench work. When fired with the bayonet attached, the bayonet tended to fall off. It became dangerous to the rifleman in the dust, mud and dirt of battle field conditions. Also, it was intolerant of any other but Canadian made .303 ammunition. There were political implications in its being retained, but by spring 1915 over 3000 men had discarded it in favour of the Lee Enfield even under the threat of punishment for so doing. Eventually, in the face of pressure from men, officers and the high command, it was replaced with the Lee Enfield, British-made rifle. The Lee Enfield survived as the rifle of choice until as late as 2012. Snipers continued to prefer the Ross rifle because of its long barrel. 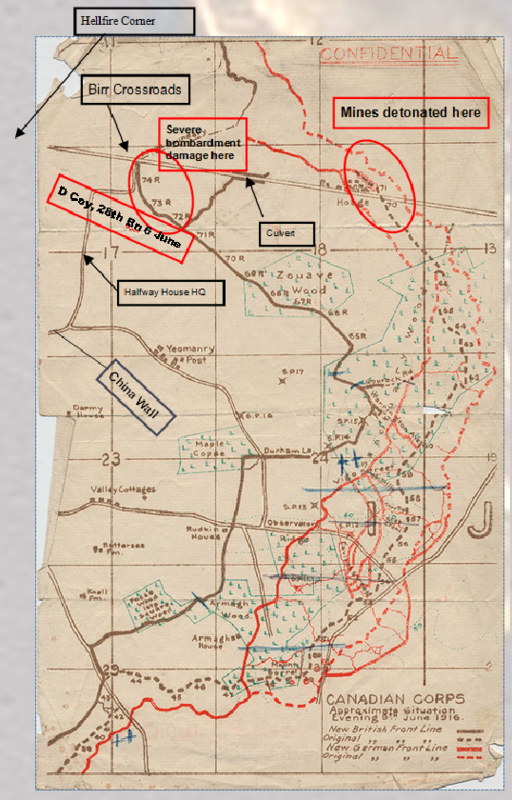 WLH/D Coy in trenches 6—8 June at Hooge, (D Coy in support trenches 72R and 74R) 13 June D Coy to China Wall, Birr Post and Ramparts (in Ypres), 20—27 June in trenches, 21 June in trenches 26,27,28. After this battle, the Battalion, spent a few days in reserve, resting and being reinforced, then went back into the line where it stayed (on rotation) until September when it moved to the Somme.